One of the best things about a vacation to the Isle of Palms, South Carolina, is the abundance of water activities you can enjoy during your stay. Whether you want to take a dip in the ocean or hop on a jet ski, you’re sure to have a fun time. If the latter option sounds appealing, take a look below at the top places for Isle of Palms jet ski rentals! In addition to Isle of Palms jet ski rentals, you’re likely looking for more wonderful things to include on your vacation itinerary. Access our free Vacation Guide to discover our top recommendations for activities and attractions on the Isle of Palms! From the best golfing and shopping to boat rentals and bike rentals, everything can be found in this carefully curated guide. Tidal Wave WaterSports, located at the Isle of Palms Marina, offers WaveRunner rentals that can accommodate up to three riders at a time. Enjoy one hour of rental time and a fabulous three-mile riding area. Your rental fee includes a life jacket, but we recommend bringing along sunglasses and sunscreen as well! Reservations are required and rentals require a valid driver’s license. Tide Wave also offers guided Safari Tours on your Isle of Palms jet ski rentals! This is the perfect family activity and is fun for all ages. Rentals are guided through the Charleston Harbor and make a stop at Capers Island along the way. Enjoy one and a half hours of sun, water, and plenty of wildlife! Another great place for Isle of Palms jet ski rentals is Hydrofly Watersports. Similar to Tidal Wave, each WaveRunner can accommodate up to three riders and is available for one-hour rentals. All rentals are guided at Hydrofly, and you can enjoy a 10-mile riding area. Rental fee includes a lightweight life jacket, but remember to bring along your sunglasses and sunscreen if desired! Rentals required a valid driver’s license, and all drivers must be at least 16 years of age. Lightning Bugz Rentals offers non-guided jet ski rentals for one and a half hours. You can choose from different kinds of jet skis experiences based on where you decide to ride. In the Isle of Palms, enjoy a natural, less busy riding experience with the possibility of spotting dolphins! You can also choose a sightseeing ride through the Charleston Harbor or a ride to Folly Beach to see the Morris Island Lighthouse. Lightning Bugz has a three-ski minimum, so this is a great option for larger parties! Rentals include lifejackets, a waterproof pouch for your phone, a waterproof watch, and an overview of the riding area you choose. After a fun-filled day on the water with your Isle of Palms jet ski rentals, grab a bite to eat at one of the best restaurants in town before heading back to your beach house to relax. 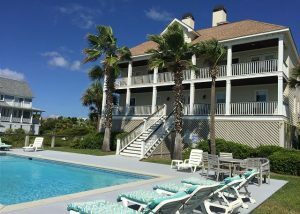 If you’re searching for where to stay on the Isle of Palms, East Islands Rentals offers the best vacation houses in the area! Our Ocean Escape house, for example, is located right on the beach and features a private heatable pool, an elevator, and the most spectacular views. You’ll love the six, spacious bedrooms, beautiful kitchen, oceanside porches, and more. You can’t go wrong with any of our East Islands vacation rentals! Browse all of our vacation rentals now and book your stay today! We can’t wait to host you on the perfect Isle of Palms escape.